Municipal code amendments that clarify rules for the 78 food truck operators in San Diego were approved Monday by the City Council. 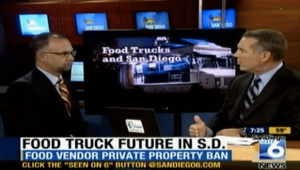 Food truck vendors have been frustrated with code provisions that make it difficult to operate on public streets and illegal to conduct business on private property except in downtown — and that’s only if the property-owner obtains a conditional use permit. Restaurant owners, meanwhile, have been concerned that nearby mobile purveyors of meals are cutting into business. The trucks have exploded in popularity due to improved menu quality and options. The trucks will be allowed to operate without a permit in industrial, commercial and high-density residential areas. The proposal generally prohibits them from low-density residential neighborhoods, parts of the restaurant-heavy Gaslamp Quarter and Little Italy, streets near the beach and roadways close to the city’s three major universities unless they obtain special events permits. They will generally be allowed on private property with a permit that would cost up to $935, which the staff report says is consistent with other cities. • The trucks will not be allowed to sell alcoholic beverages, general merchandise or commercial services. • No equipment aside from refuse containers will be allowed outside the trucks. • No amplified music will be allowed. • And pedestrian and vehicular traffic should not be impaired. An earlier proposal to keep food trucks a certain distance from restaurants was not included because it would not be consistent with state law. “I think this is a good compromise,” said Councilwoman Lorie Zapf, who guided the regulations through the Smart Growth and Land Use Committee she chairs. The new rules will not apply near the shoreline until the California Coastal Commission grants its approval, or near local airports until the San Diego County Regional Airport Authority weighs in.